The dextra utility began its life as an alternative to the AOSP's dexdump and dx --dump, both of which are rather basic, and produce copious, but unstructured output. In addition to supporting all their features, it also supports various output modes, specific class, method and field lookup, as well as determining static field values. I later updated it to support ART (which is also one of the reasons why the tool was renamed). The dextra tool is provided as one of the free downloads provided for the "Android Internals" book (http://NewAndroidBook.com/). You are welcome to use it even if you don't buy the book (though naturally you're even more welcome to buy the book :-). Its method of operation and a lot more about Dalvik internals is covered in detail, in Chapters 10 and 11. Its latest version, as a tar file with binaries for OS X, Linux/Android x86_64 or Linux/Android ARMv7, can always be obtained at this page right here. You might want to check back frequently, as I'm currently updating the tool, and adding features, specifically in the decompilation department. Latest compilation date (Mar 24rd 2017) supports significant improvements to the disassembler and decompiler engine. For updates, you might want to check out the RSS feed, or follow my company's feed, @Technologeeks, which (aside from the occasional OS X/iOS related stuff) tweets about updates to this and other tools. If you want to learn how Dextra actually works - DEX and ART get almost a full day in the Android Internals & Reverse Engineering Training course my company, Technologeeks, offers. Come join us! This is DEXTRA, version 1.29.79 (N,PR3), compiled on May 24 2016. Things get more interesting when you use -m (to display methods), -f (to display fields) and -j (for Java-style output). 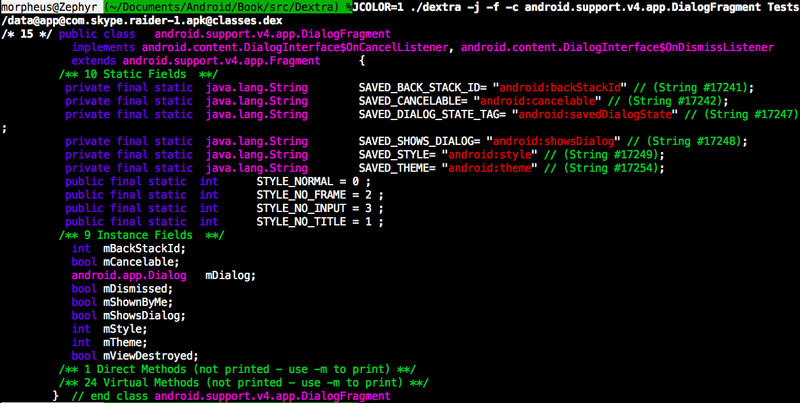 -v (verbose) is optional, and will print out class, field, method and string indices as Java comments. Since classes.dex normally contains hundreds of classes, a good idea is to use "-c ..." to filter for the class you want. The x:y notation is for the class index and field/method index. As the above shows, dextra will automatically determine static values for Java primitive types, if found in the static values of the class. As of 1.3 DexTRA recognizes ART reflected classes, but at this point using hard-coded offsets. This will most likely render it incompatible with future releases (*sigh*), but the only way to make this forward-compatible would be to implement a mini-reflection engine inside DexTRA itself. Which I will, probably, at some point. But now is not that point. With the functions in the code, it's trivial to turn DexTRA into a fuzzer. I personally see this as a fairly fruitless endeavor, since even if there is some heinous overflow in the ART parser (and there is, I can practically guarantee), one would have to write to /data/dalvik-cache (or /system/framework/../boot.oat|art), which requires system access. And if you have system, you're pretty much done. -h will now just show the header and nothing else. There's a new -l switch to list contents. Android M Preview (OAT 062 and ART 015) support. Still not handling all opcodes (lazy on the arithmetic/logical) but will get to that eventually..
Versioning scheme changed - version is now 1.artVersion.oatVersion. This ensures monotonically increasing version numbers with Google's capricious changes. I've also included the exact compilation date, so you can see if you have the latest version. Android M Preview 2 through Final (OAT 064 and ART 017, hence version number 1.17.64) support. Why Google keeps changing the internal structure of ART breaking compatibility so bad eludes me. But (so far) I'm keeping up. Strings are different (again), and most importantly the ART header is entirely incompatible with previous versions - but at least makes more sense. Note: I am discontinuing support for ART 015/OAT 062 since they're likely to not ever see the light of day again as M progressed into final (which is compatible with PR2). Added -delta to apply image delta. This is useful when comparing output to oatdump on a device, which will provide shifted addresses. Decompilation (-j -D -d) significantly improved, to get arguments to functions and even follow if statements. Still far from where I want it to be, but already getting useful! 03/16/2016 Changes: Shame on you, GOOGLers. Changing ART/OAT again without so much as a comment. Won't work, though - Dextra can now handle N Preview Release 1. See you next PR..
Works with new .vdex files - as of O, .oat no longer embed the .dex in them. If you want any feature which I'm not covering (or not doing a good job at), let me know. I will gladly take requests. -deep (array dump for ART files) crashes sometimes. I've tested dextra extensively, and also people have been nice enough to send me dumps aplenty. That said, with all the devices out there (and myriad versions of ART), the tool may crash. If you encounter any bug I don't know about, you've run into a use case I didn't consider. So, please shoot me a line. The only way I can fix bugs is by first knowing they exist. Why not use oatdump? If you like oatdump, you can and should use it. That said, oatdump is A) crude B) delivers copious output (we're talking upwards of 1GB!) which is not friendly C) only runs in Android since it essentially initializes ART and doesn't really parse, so much as load and dump, and is therefore D) not really applicable outside the exact version of ART your device runs, or on other devices..
Why is this not open source? Because it isn't, at least for the moment. I reimplemented the entire DEX/ART/OAT parsing logic and a lightweight VM from scratch here - no mere feat. I do make the "engine" of Dextra available as a dylib for integration with other fuzzers/tools/etc. But that'll require a license. Drop me a line if interested. Why is the tool sometime crashing on _____.art or ____.oat? Because Google changes the format internally faster than I can keep up (q.v. Volume II which discussed format changes in depth). Tough. But if you send me samples, I'll fix the tool so it doesn't crash on your favorite .oat or .art. If you find this useful, pointing your browser to http://NewAndroidBook.com/tools/counter?dextra - if I can ask you to cut/paste this (so bots don't auto-follow and I get a human count :-). would be appreciated. * - The tool was originally named "dexter", but was renamed because of A) conflict with another tool (not mine) with different functionality and B) support for ART.